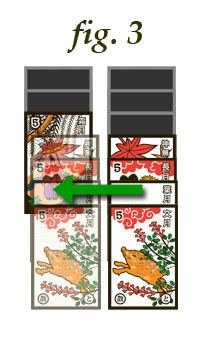 Start by dealing one card upturned and five cards downturned to the right of the upturned card. Start the second row in the second column with an upturned card. Fill the rest of the second row with downturned cards. Continue in the same fashion until the sixth column has six cards with the last card upturned. Leave space for four foundations, above the tableau (fig. 1). Build four foundation piles of 12 cards each from cards from the tableau and the waste pile. Each foundation pile starts with a card from the January suit (hiki) and builds up to a card from the December suit. For example, pine would be followed by plum blossom, cherry blossom, iris, peony, bush clover, suzuki grass, chrysamthemum, maple, willow and paulownia. Each foundation must start with a card from the January suit (fig. 2a). 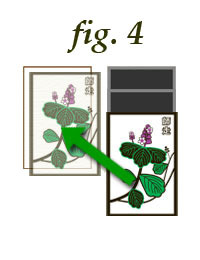 Cards in the tableau may be moved to reveal downturned cards. 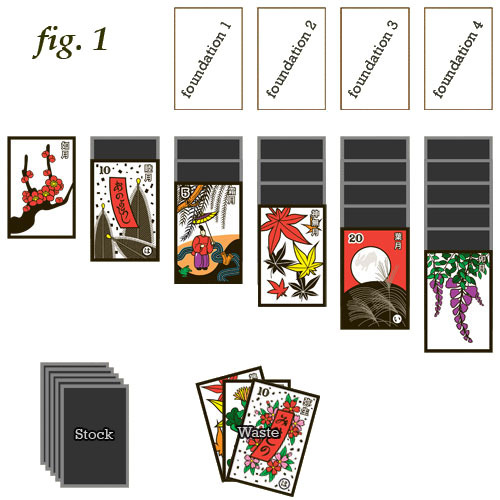 Cards from the stock may be drawn to build on the tableau or the foundation piles. Draw three cards from the stock and pile them upturned in a stack called the waste pile. 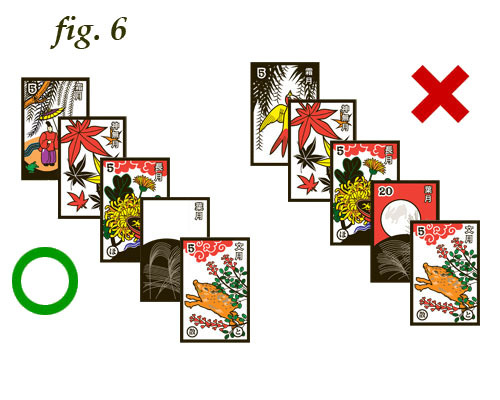 The last upturned card can be used to build down columns in the tableau or build up the foundation piles (fig. 2b). Any card revealed in the waste pile below the top card can be played in sequence as they become the top card. Once the stock has been exhausted, the waste pile is turned over and becomes the stock pile. Cards in the tableau can be built down from the top upturned card on each column. Building down means that only earlier months can be placed on top of later months. For example, the October suit can be placed on the November suit (fig. 2c). 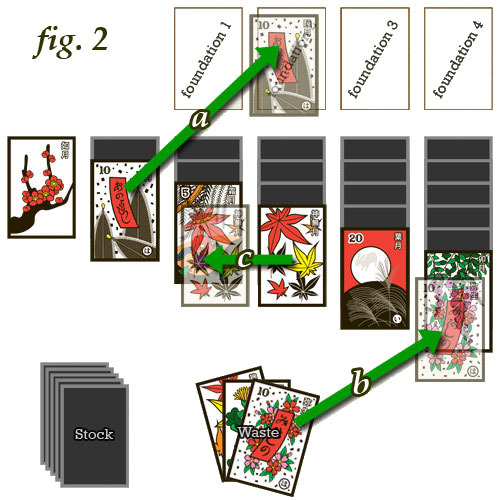 As long as the upturned cards are in descending order whole columns may be moved (fig. 3). Empty columns may be started with a card from the December suit, and built down from there (fig. 4). Continue to build up the foundations, until you have used all 48 cards to build four foundation columns, or until there are no more moves left. 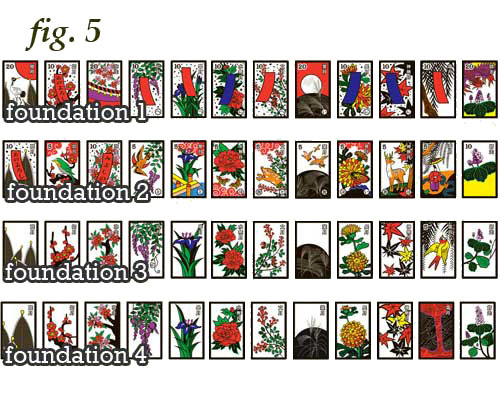 The first foundation is made up all the highest point cards of each suit. The second foundation is the other point cards. The non-point cards are the last two foundations. If you look carefully there are left and right orientations to the images on the non-point cards. Foundation 3 is left, and foundation 4 is right. Only allow yourself three passes through the stock pile.